What is the purpose of a passkey? Do I need to get a passkey? Where can I get a passkey? Should I keep my passkey secret? What do I do if I forgot or lost my passkey? Why does the passkey web page ask for my email address? Is there an easy way to enter the passkey into the client? The passkey, a new feature beginning with the v6.0 FAH client, is a unique identifier that ties your contributions directly to you (not just those with your username). The use of a passkey prevents others from cheating using your name. Obtain a passkey from our web site (see below), enter it when you configure the client, and the client and servers will do the rest. You should keep your passkey secret. A passkey uniquely identifies you as an individual donor and is associated with results that you have completed. Previously we did not have unique identifiers in Folding@home (usernames for example can be shared by many people). One main benefit of passkeys is that if someone cheats, we will not need to zero out the points of everyone with that username — only the offending party and those without passkeys. Perhaps more interestingly, we have introduced a new Quick Return Bonus (QRB) points program, which is tied to passkeys. To earn this bonus, you must use a passkey. Finally, the existence of passkeys opens up future possibility of displaying your individual credit and other information, rather than just by username, so use the same passkey for all clients. No, you can leave it blank during configuration and the client will operate normally. But we will not have any way of distinguishing work units you completed from the work units others with the same name have completed. And you will not be eligible for the new bonus points program, currently available for multi-cored CPU projects, and some new GPU projects. Note: The passkey request form is case sensitive. In general, yes! Do not post a passkey on the Forum, etc. The natural exceptions to this general rule are using the passkey in the client (of course) as well as Folding@home web sites and related sites. 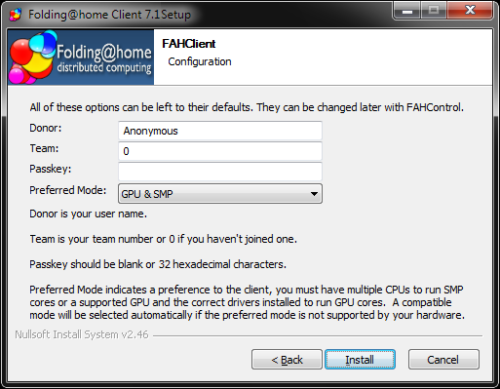 We are working to use the passkey to allow donors to get more information about their Folding@home client machines. Also, we are working with partners to use the passkey to validate donor’s names with their emails. Go to the passkey web page and fill in the same information as before. You will get another email with your same passkey. Note:If your original email address is no longer accesible, you will need to enter a new email address, and you will be sent a new and different passkey. We send the passkey to you by email. If we just displayed the passkey on the web page, then anybody could claim a passkey in your name. Sending the passkey to your email account is more secure because only you have access to your email account. Note: We recommend using an email address that you plan to keep for an extended period of time. If you ever lose your passkey, you can get another copy of the same passkey by submitting another request using the same FAH user name and same email address. Yes, during installation of V7 or for the older v6 software, during the initial client setup. You can copy your passkey from the email you receive from FAH, and paste it in. Please do not enter the passkey by manually edit any .cfg file, as it’s not a plain text file and could become corrupted. On a Macintosh console client, Command+C to copy, and Command+V to paste. In the V7 setup, the Windows V7 Installer has a prompt to enter a passkey after a name and/or team number. In the V7 FAHControl, a passkey can be added under the Configure button, Identity tab, Passkey field. Note: Use one and only one passkey for all clients. There is no advantage to using multiple passkeys, and several disadvantages.